In honor of my Independence Day and celebrating 17 years as a sovereign nation, I minted some new currency. The blurry photo is to thwart counterfeiters, naturally. The new 500 Kronicle note is no longer pegged to the Chinese Yuan and is currently floating. These notes are worth $1.0462 as of today. 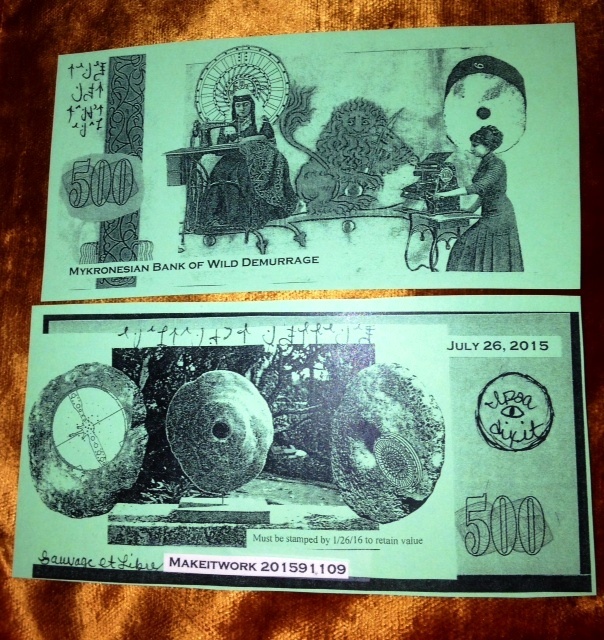 The new 500 Kronicle note features a lion playing a fiddle, ladies at work and Yap Island Rai Stones. Yap Island, located in the Caroline Islands and part of Micronesia, has its own lush and complex monetary history and is a favorite of economists. While the Yapese currently use US dollars for most of their exchanges, Rai Stones remain a traditional currency. Rai stones are massive rocks weighing several tons with a hole carved in the middle (many quarried in nearby Palau and brought over by boat), and are too heavy to move. So while they function in Yapese society as money and can used to buy things and pay debts, they are not moved to be closer to their new owners when they change hands. They remain in the front yards of the original owners. But importantly, everyone in town knows who owns which Rai stone. There is even a story, perhaps apocryphal,that a particular Rai stone was lost at sea but continues to be traded as currency. The new notes are also an experiment in demurrage currency. The notes are set to lose value weekly starting 9/1/15 unless stamped by me. Stamps are available starting on 9/1/15, the same day the bills start to decay. More about demurrage: Demurrage is a holding fee. Money set to lose value the longer you hold it generally encourages circulation. Since my money doesn't exactly circulate, I wanted to keep the Kronicle from becoming a purely ceremonial currency (such as Joss Paper, made to be burned) and encourage people to interact with it, revisit it, watch it decay, or add more value. One anagram among many. Performance, writing, images. Radio Plays and other adventures.